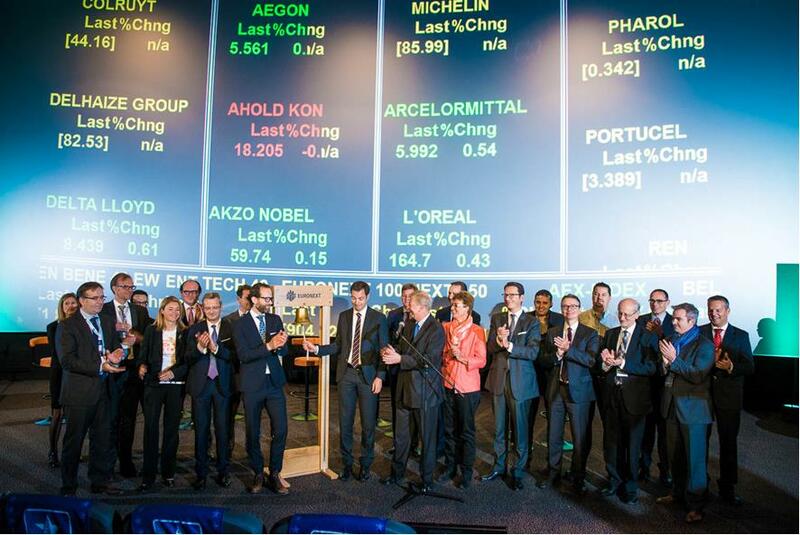 Amsterdam, Brussels, Antwerp – On 12 October 2015, Euronext held its first Benelux Capital Day in Kinepolis Antwerpen. The event, which gathered more than 200 professionals and 50 speakers for the first cross-border ‘access to finance’ conference was entirely dedicated to tech and growth companies. To kick off the event, Belgian Deputy Prime Minister and Minister of Digital Agenda and Telecom, Alexander De Croo, opened the European markets by ringing the Bell. The Benelux Capital Day aims to fill a gap in the Benelux investor communities. On one hand, this event facilitates the cross-fertilization between Belgian and Dutch investor markets and, on the other hand, it strives to make technology and growth companies in the Benelux more attractive towards investors. The first edition of the Benelux Capital Day gathered all key stakeholders involved in the Benelux ecosystem (listed and non-listed companies, investors, banks, associations, law firms, accountants, advisors). Speakers included Philippe De Backer (Member of the European Parliament and President of the EU IPO Task Force), Petra Zijp (Partner and Head of Capital Markets at NautaDutilh), Robbert van Heekeren (CFO of Kiadis Pharma), Vincent Reuter (CEO of Union Wallonne des Entreprises), Jean-Pierre Blumberg (Partner at Linklaters LLP) and many others. Following the success of this first edition, a second Benelux Capital Day will be held in the autumn of 2016.